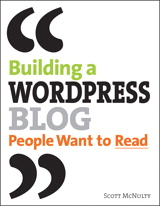 This is a great book for those starting out with WordPress. McNulty goes into detail on every facet of properly setting up a new WordPress blog. It has lots of illustrations to demonstrate every step. A real find for any beginner–wish this book was around 3 years ago when I set up my first blog, it sure would have been helpful and a real time saver. The author does an exceptional job at explaining everything and making it all rather simple to understand. Valuable for WordPress.com bloggers but especially for WordPress.org users–if you don’t know the difference, McNulty will explain it to you. While this is essentially a wonderful ‘beginners’ book, there are also a couple of chapters which are beneficial for intermediate bloggers. In Chapter 2, the author goes into detail on how to install a WordPress.org blog and set up a MySQL database–not something that I would suggest for beginners. I would propose that it would be best for most to find a host that offers a one-click ‘auto-install’ option for installing a WordPress.org blog (via Fantastico or Simple Scripts)–far easier with less potential for trouble. In Chapter 12 on themes, there are 8 pages on “Tweaking a Stock Theme“, the author gets into ‘The Loop’ and the code demonstrating how one could change and somewhat customize a stock WordPress theme and make it your own. This section is also for more experienced users. Nice blog about book reviews. у вашего сайта красивый дизайн, сами делали? Thanks. Actually I teaked Daily32 Version 3.0 by Daily Blog Tips. com.